Have you been waiting for the perfect downtown Southern Pines' property? Here it is! Just two blocks to Broad Street! This elegant two story cottage inspired home has loads of character & fine finishes. Beautifully designed open floor plan w/ plenty of space for relaxation & entertaining. Classic built-ins frame the gas fireplace and wainscoting completes the intimate feel. Downstairs master bedroom ensuite has a walk-in closet & private deck. Upstairs offers two bedrooms, a stunning guest bath, and a large bonus room with lovely pocket doors. Outside there is a fully fenced back yard, w/ passenger gate. Stairs lead to an unfinished space 19'x13' above the 1 car garage. 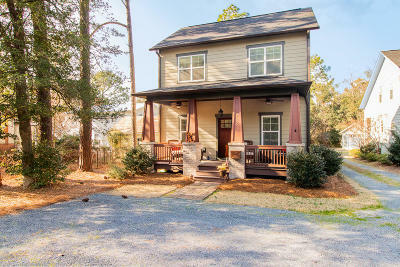 Come relax on the spacious front porch and enjoy your new Southern Pines home.